Whether you want to make quilts, garments, crafts or decorations for your home, Activa machines are packed with power, features and fun. The Activa 230PE offers a precise CB Hook, which ensures perfect stitches on any fabric, and a powerful DC motor, which penetrates layers of fabric at any speed. 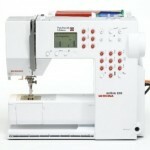 The Activa 230 Patchwork Edition is the perfect piecing machine and great for garment makers, crafters, and home dec sewers. 204 stitches (including alphabets), 10 quilting stitches.